In Chinese philosophy, yin and yang describe how seemingly opposite or contrary forces may actually be complementary, interconnected, and interdependent in the natural world. Each completes the other, bringing it to perfection. This closet is the perfect example of Yin Yang. It started as a single large space. 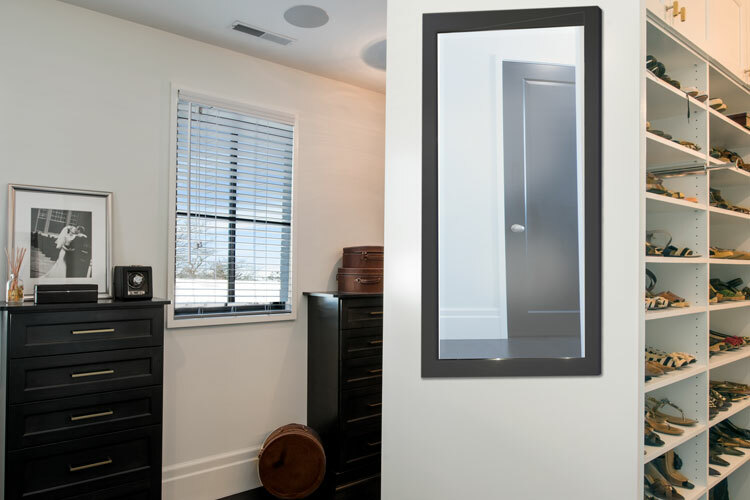 However, in order to serve the needs and preferences of two homeowners with distinctly different personalities and preferences, a center hanging wall was constructed that essentially divides the room into two separate, but complementary spaces. 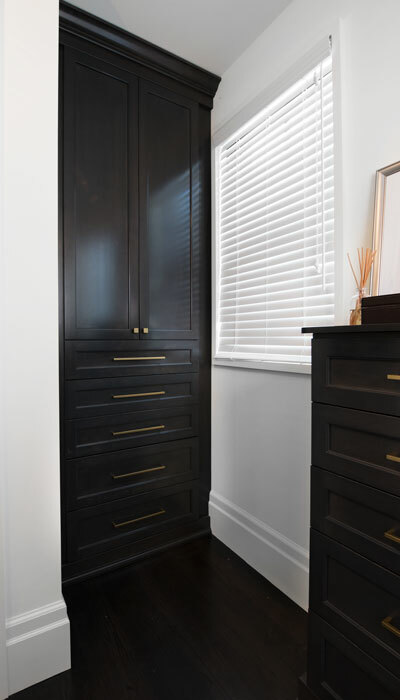 Unique, but equally luxurious designs were developed for each side — the closet is a combination of painted and stained wood, and luxury features include the under shelf LED lighting system over all the rods. 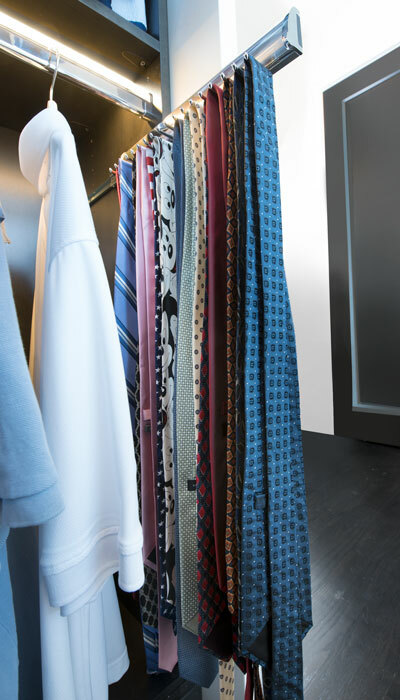 The combination of light and dark colors, textures and finishes on each side of the closet are used for the perfect balance of Yin and Yang. 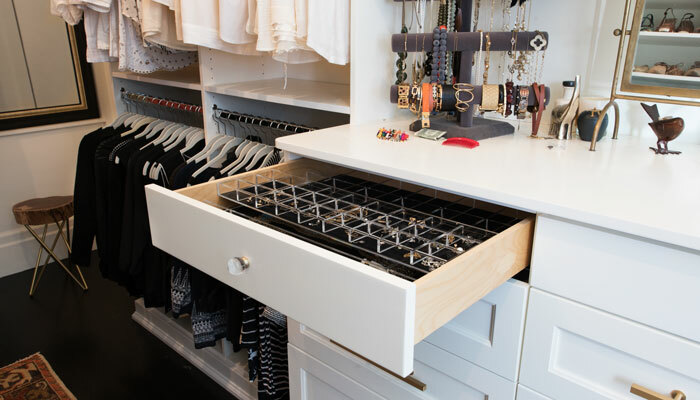 Her side of the closet is a bright dynamic space with places for all the components of a truly extensive wardrobe. Although the closet was divided evenly down the middle, she had quite a bit more clothing and accessories than her husband. The solution was to assign her the side without any windows, giving a full extra wall to run hanging rods and shelves to accommodate the extra clothes and shoes. 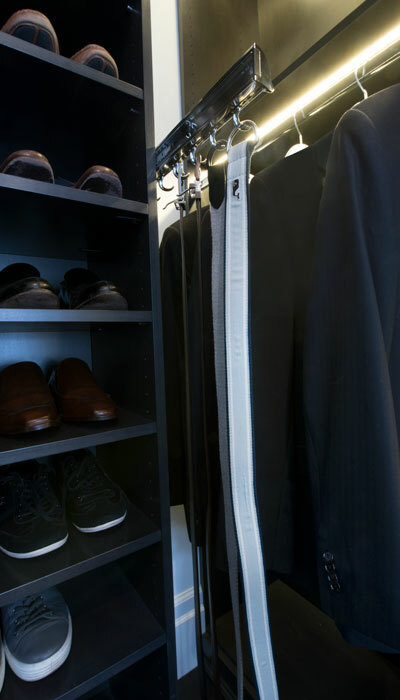 The closet system runs to the ceiling with a row of upper cabinets above the hanging rods and shoe shelves that are perfect to store seasonal or infrequently used items. 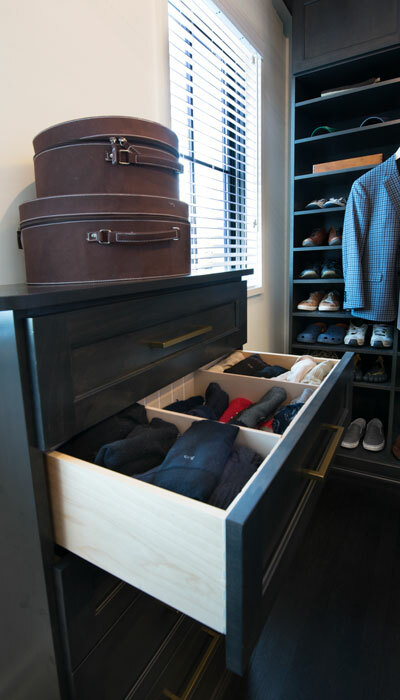 A large 15 drawer hutch dominates one wall of the closet. It is designed to corral an abundance of lingerie and small accessories. Three velvet jewelry drawer organizers were included to keep a truly elaborate collection of necklaces, rings and earrings organized and tangle free. The triple hutch has enough countertop space to allow the accessory overflow to be staged in decorative boxes and display trees. Sweater shelves were located above the hutch for knits and other folded items. The opposite wall consists of double hang areas and a huge bank of shoe shelves plus valet poles and telescoping belt organizers. 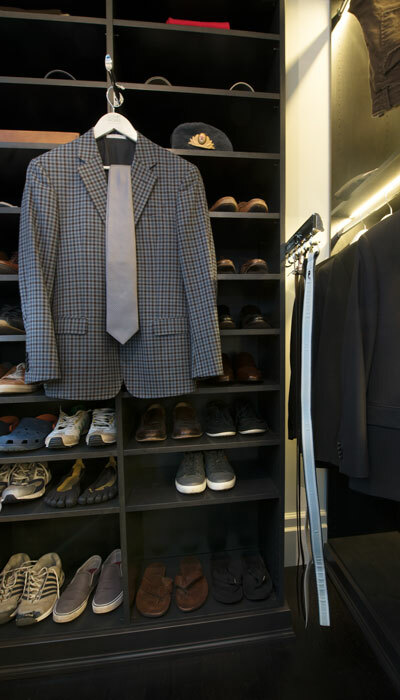 Because this is not only a closet but a dressing room, hanging and shelving along the back covers only half the wall, creating a small but elegant and very private niche furnished with a valet pole, chair and mirror for trying on clothes. 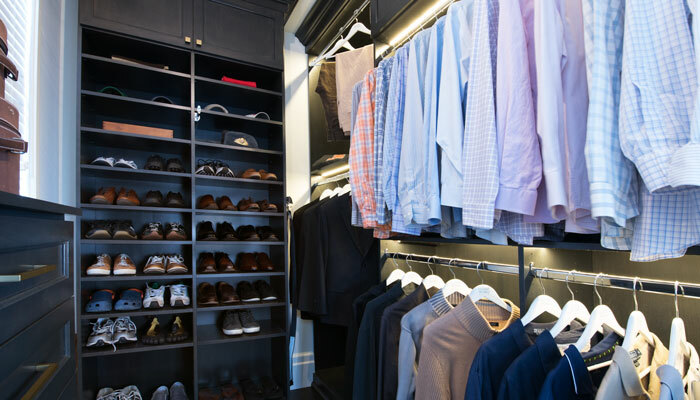 Like the icing on a cake, the LED closet lighting system illuminates it all, and highlights the extensive features of this dressing room/closet. His side of the closet is quiet and refined. The use of stained wood in minimalistic shades of black and gray for the shelving, custom dressers, and hanging areas suited this dapper gentleman who definitely likes the finer things in life, but is very selective in his possessions. The dark wood compliments the expresso tones in the wood flooring that runs throughout the home. Three large windows keep the closet from appearing too dark. 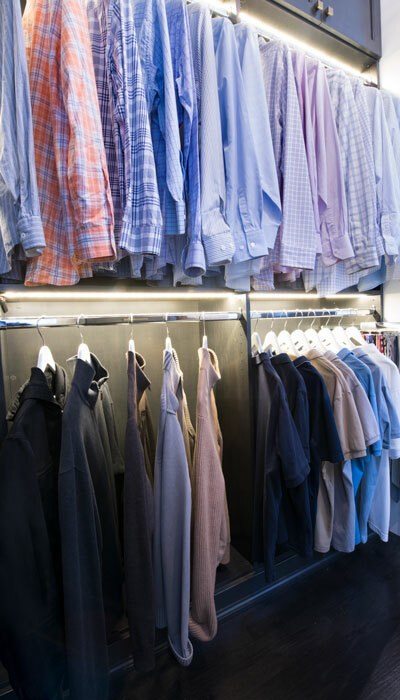 Spaces for formal and informal clothing were separated on his side of the closet with the double hang clothing rods and the inclusion of two separate dresser/drawer units custom fitted between the windows. Dividers keep all the drawers neat and tidy. 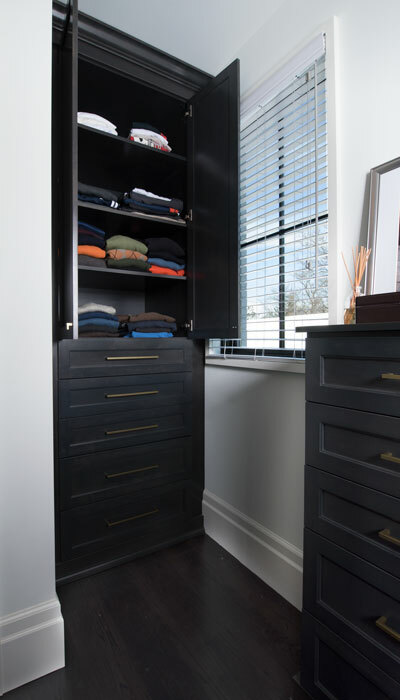 A large bank of shoe shelves occupies the far wall, while a built-in armoire style cabinet keeps jeans, sweaters and knit shirts organized in the opposite corner. Fully backed floor based system in wood that is stained on his side and painted on hers. Lighting was installed above all the closet rods and the wires and transformers were hidden behind the crown molding to keep it concealed, but easily accessible for servicing. All drawers are undermount, soft close units.